They will be many colors to choose from soon. 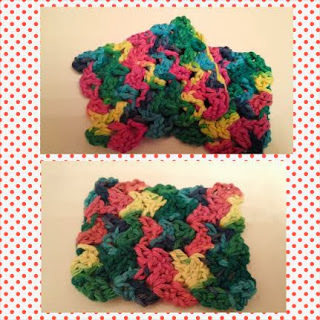 It will be listed under my category Dishcloth. The size is 3 1/2 by 4 1/2 Made out of 100% Cotton by Peaches and Cream. This item is great and will last a long time. Great ideas for personal use, Babies, Cleaning Chores ,House warming Gifts.